Apple has released an update for Macs running Mac OS X Snow Leopard. The update improves the graphics performance in the OS. The update is called “Snow Leopard Graphics Update” and it effects the performance of running games like StarCraft II, Portal and Team Fortress 2 as well as Aperture 3.
â€¢ Addresses frame rate issues occurring in Portal and Team Fortress 2 by Valve, on iMac (Late 2009 and Mid 2010), Mac mini (Early 2009 and Mid 2010), Mac Pro (Early 2009), MacBook (Early 2009 and Mid 2010) and MacBook Pro (15-inch, Mid 2010) or MacBook Pro (17-inch, Mid 2010) models. â€¢ Resolves an issue that could cause Aperture 3, or StarCraft II by Blizzard, to unexpectedly quit or become unresponsive. â€¢ Resolves an image corruption issue that may occur when disconnecting and reconnecting external displays while the system is running. Download link: Snow Leopard Graphics Update. 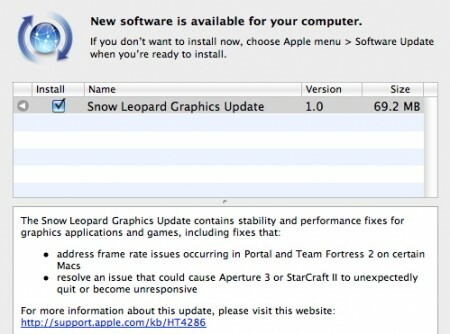 More information: About the Snow Leopard Graphics Update.